Developer Coding Hamster Studio has a match 3 game built in Delphi XE6 Firemonkey published on Google Play. It looks like it uses the Jet premium style and is probably based off the Bejeweled clone source code released by Joaquin Monedero from Embarcadero. You can check out the source code for that Bejeweled clone here. The original source code was built for Delphi XE5 Firemonkey but Gem Genie is published in Delphi XE6 based on investigating the APK file (I guess it could also have been published with AppMethod or C++Builder). In any event the game and graphics are pretty slick and fast on a Nexus 7 tablet. It has sound as well using MP3 file resources. Google Play is showing a download number of between 5,000 and 10,000 which is pretty respectable for an indie game which has probably had little to no marketing. If you have an Android device head over and test it for yourself to see what is easily possible in Firemonkey. 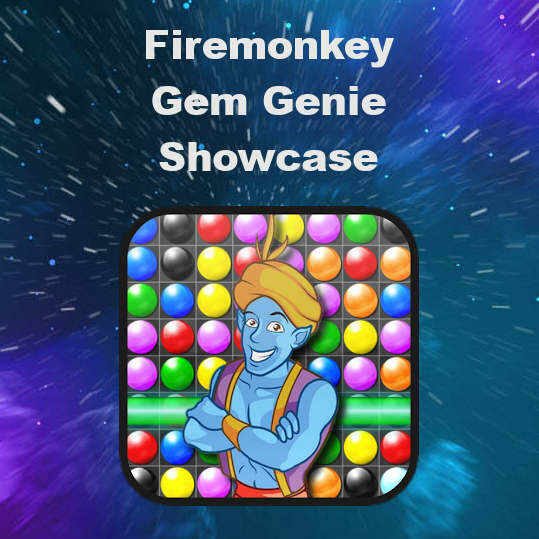 Download the Gem Genie game built in Delphi XE6 Firemonkey from Google Play. I am the author of GEM GENIE, so thank you for mentioning my little game. I did indeed read the source code of Joaquin Monedero’s program and it was a great help (although I ended up programming things a bit differently). Your website is a treasure trove for us Delphi developers, so keep up the good work! I did create GEM GENIE in Delphi XE5 actually (although I now use XE6) and as you noticed I did not invest in any marketing. My little game was just an exercice to get familiar with mobile development in Delphi. BTW, the main program I have written in Delphi is for Windows only (it’s VCL, not FMX) and is called FotoSketcher.